Cat and I decided to go for a hike yesterday on Mount Sutro, the wooded mountain in the middle of San Francisco. Since we knew we’d be in for some calorie-burning, we stopped on the way at our neighborhood pizzeria, Pizzetta 211, a tiny place that is often rated as the best in the City. Cat had a bacon and butternut squash pie with chipotle crème fraiche. I had one with homemade sausage, radicchio and Gruyere. Sorry, I didn't have my camera along. Though the toppings on their pizzas are often unusual (e.g., Pancetta, farm-fresh eggs, fingerling potato slices and sage), and always delicious, what makes their pizza so great is the perfect thin crust—tender but firm in the middle and super crispy around the crown. It’s also a really friendly place, staffed with latter-day hippies who are very serious about their ingredients. As we were finishing up, and resisting the ginger cake and apple tart, I asked the fellow who was clearing our table what flour they used in the dough. He told me they used Giusto Baker’s Choice, an all purpose flour, and asked if we had other questions. Since he seemed to want to chat, and since I’ve always wanted to make pizza like theirs, I told him I’d love to watch their dough-making process some time. He didn’t invite me to do so, but he launched into a lengthy discussion of their dough-making process. From the conversation, he gathered that I knew a thing or two—but not three—about making pizza, and his explanations were sophisticated and enlightening. Turns out he’s the founder of the place and the pizza master. I won’t go into all the details here, but—in short—he starts with a sort of poolish, about 90% hydration with cool water, then adds the remaining flour gradually during a 30 minute slow-speed mix. He didn’t know the hydration; he mixes by feel. The dough is then refrigerated overnight, punched down and scaled in the morning and put back in the fridge until used; they’re shaped right out of the fridge. This seems like a pretty novel approach, one he developed over many years of experimentation. He told me a modified—simpler—recipe is on Sunset.com (http://www.sunset.com/food-wine/techniques/pizza-00400000063254/), but it’s worth it to experiment with different hydrations, different mixing times and different retardation times, until we get it like we like it. I will start these experiments soon. As for my own baking, it’s mostly been repeats of favorites lately, after several weeks of pastry and bagel trials. 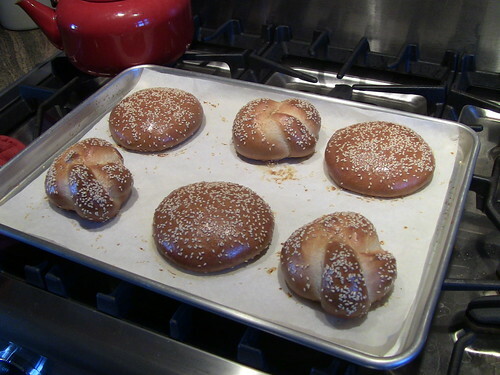 Last week I made double knot rolls and sandwich buns from the ITJB Honey-Whole Wheat Challah. 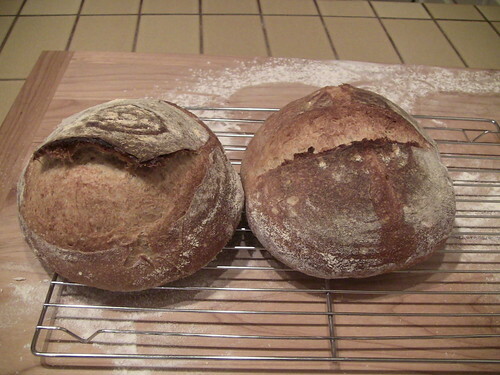 And yesterday I made a couple half-kilo boules of Tartine Basic Country Bread, with my usual twists (http://www.thefreshloaf.com/node/24002/my-variations-tartine-basic-country-bread–-more-whole-wheat-smaller-loaves-and-half-retar). I retarded half the dough and baked two more today. I've settled on a dough like this, but I'm even lazier. I'll mix up a 78% hydration dough of AP flour with 1/4 teaspoon yeast, a bit of olive oil, a bit of salt. Mix until just combined; it'll develop on its own with little needed kneading or stretch/fold. I let it ferment overnight on the counter, then retard for 1...2...3...4...5...6...........10 days even. It's ready for pizza by Day 3. I'll poke it around every day or so and, when ready to make a pizza, take a glob out, put it in an oiled bowl, let it come to room temperature, make the pizza, and bake it. Have to make and bake it on parchment, as it's too sticky to make on the peel (have tried that a couple times to hilarous failure). It comes out just like Pizzetta 211, thin and crispy. I like their flavour combinations, although some of the cheese selections are kinda' strange. Marscapone? Creme fraiche? I really need to get that Tartine book. I love your country breads everytime I see them. That sounds interesting also, but quite different. 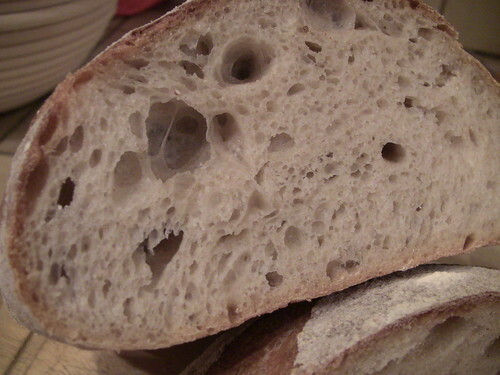 Pizzetta 211 uses a pretty intensive mix and bakes the dough right out of the fridge. Thanks for the comment on the BCB. Try it, you'll like it. Reading fast and understanding nothing. Sorry for making you read all of that and not realizing it's almost completely opposite to what they're doing. Just bought used copies of Tartine and Maggie Glezer's Artisan Baking, so BCB and Glezer's ciabatta (re:PiPs latest blog post) are in my future. Pizzetta 211 sounds like my "kinda" place. Pitty, I am nearer the East Coast, so I'm enjoying your visit vicariously. Am wondering how Giusto Baker's Choice flour, compares to King Arthur's all purpose, protein wise? Keeping the dough cold, shaping, topping, and baking, with hardly any rest time would serve to help keep the dough thin I'm thinking (a question). Nice double knot rolls, sandwich rolls from whole wheat Challah, and great looking boules. Thanks for sharing.